Right there with you! Cannot wait to read this one! Sadly, I haven't read this series yet. [Or the first one] I'm kind of worried about it - being Faeries and all, since I'm not the biggest fan of Fey. Nice choice though. Beautiful cover! YES! I am excited to read the second book in this spin off series. I really liked Ethan and Keirran. Kenzie was awesome too! Great choice. Awesome pick! I can't wait for it either!! I haven't read any of these books yet. I bought the Iron Fey series and they are on my summer tbr, so hopefully I can get caught up. 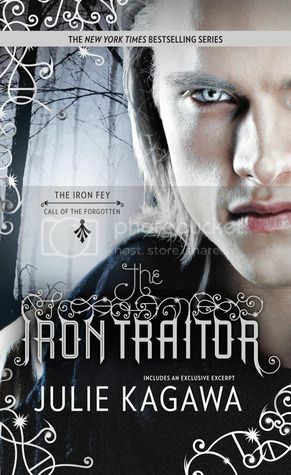 I just started the Iron Fey series so I'm a little behind on them but I have all the books on my to-read list and this one will be added soon. I hope you enjoy reading it. Great pick! The next Iron Fey book? Well, of course! To be honest, I'm not super into the dude on the cover but I'll read the book all the same! Love this series too! I need to find out what happens next...though the "iron traitor" only poses more problems :P. Great pick! I have heard some good things about this series and how it differs from the original Iron Fey-I had a lot of problems with the characterization of Meghan so I didn't think this would work for me either. Take Labyrinth, crash it full-speed into The Neverending Story, and mix well with The Matrix, and that's just a taste of the wildly imaginative ride you'll go on when you read THE IRON KING. It's such a pleasure to read a contemporary fantasy that's fresh and full of action, and doubly a pleasure to read the first of a series that stands completely on its own. This book is a fantastic voyage and a satisfying read, and now I'm heartbroken that I have to wait until next fall to get another bite. Highly recommended!